DOH Regional Office 6 now accepts applicants for Nurse Deployment Project and RHMPP 2015. Application period is from December 1 to December 3, 2014. Provinces in this region include Aklan, Antique, Capiz, Guimaras, Ilo-ilo and Negros Occidental. Official and Validated License from the Professional Regulatory Commission. Nurse must be physically and mentally fit. A medical certificate from a government health facility is required. Residents of the localities (city/town) where the Rural Health Unit is located. RNheals resignees are not qualified to apply. Medical Certificate from any government health facility. Valid Professional Regulation Commission (PRC) Card. Just click the online registration tab as shown above. You will then be redirected to a page where the "announcement" is posted. Scroll down and you will see the Agree and Disagree button. Click Agree then proceed to online registration. 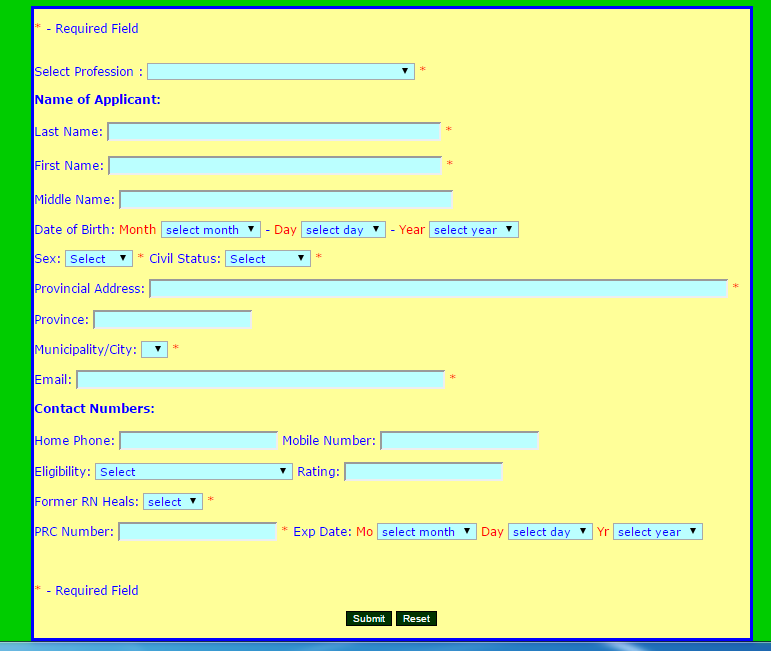 Fill-out the required fields in the form then click SUBMIT! Wait for an update regarding your exam and interview schedule, if any.